An advance team from the International Criminal Court (ICC) has arrived in Uganda to prepare the investigation of crimes committed in the war between government troops and the rebel Lord's Resistance Army (LRA) in the north, UN officials said. “An ICC team of nine people has been to Gulu where they have been trying to get interpreters for the local Luo and Swahili languages,” Andrew Timpson, head of the UN Office for the Coordination of Humanitarian Affairs in Gulu, 360 km north of the capital, Kampala, told IRIN on Wednesday. The Ugandan Defence Minister, Amama Mbabazi, told reporters on Wednesday that his government had pledged maximum cooperation with the ICC, because it was the government that referred the LRA case to the world court. "I am not surprised that they are here and I can only pledge that we shall offer them maximum support in gathering evidence," Mbabazi said at a meeting of ministers from Rwanda and the Democratic Republic of Congo, and US officials on peace in the region. 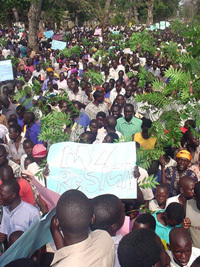 Following the massacre of hundreds of internally displaced persons (IDPs) at Barlonyo in Lira district, which was blamed on the LRA, the Ugandan government petitioned the court to investigate the crimes committed by rebels. The massacre occurred when LRA fighters dressed like regular Ugandan soldiers and armed with assault rifles and artillery, attacked the Barlonyo camp, 26 km north of Lira town, on 21 February and overpowered local militia posted there to protect it. The rebels burned many IDPs alive by setting fire to their thatched huts after ordering them into their homes at gunpoint. Other IDPs, who were trying to flee, were shot, bludgeoned or hacked to death by the rebels wielding clubs, machetes and AK-47s. Local leaders said 337 people were killed. “The Office of the Prosecutor will take steps to ensure that the crimes committed in Barlonyo camp will be investigated and that those bearing the greatest responsibility will be prosecuted,” it added. The LRA, which has waged an 18-year war against the Ugandan government, has been blamed for the killing of thousands of people in northern Uganda. The rebels, who purport to be fighting to replace the Ugandan government with one based on the biblical Ten Commandments, are led by a mystic, former altar boy, Joseph Kony. The rebels are notoriously brutal and have abducted thousands of children, forcibly conscripting the boys and obliging the girls to become sexual slaves for LRA commanders. The violent campaign has displaced over 1.6 million people, forcing them to live in squalid camps across the region. Human rights groups and the church in Uganda, have however, urged the ICC to investigate crimes by all sides in the conflict, including those committed by the Ugandan army. "It is imperative that the ICC conducts an impartial investigation in Uganda, as it has authority to investigate crimes committed by all sides, not just the LRA," Human Rights Watch said in a statement. Last month, while pledging support for the ICC, the Ugandan government said it would prosecute its officials implicated in crimes, but did not say whether it would hand them over to the ICC. "Should the court come across any evidence implicating any Uganda government official in the crimes complained of, Uganda will immediately prosecute such officials," Mbabazi said in a statement. The ICC, based in The Hague, was established by the Rome Statute of the International Criminal Court on 17 July 1998, when 120 States participating in the "United Nations Diplomatic Conference of Plenipotentiaries on the Establishment of an International Criminal Court", adopted the Statute. It is the first ever permanent, treaty based, international criminal court established to promote the rule of law and ensure that the gravest international crimes do not go unpunished.